You are currently browsing the category archive for the ‘Cornwall’ category. The final video for now from our tour of Cornish antiquities visits the Carn Euny courtyard house settlement. Continually occupied for over 800 years, the final phase of the settlement consisted of three large courtyard houses, several smaller oval buildings and a fogou. The fogou was discovered in 1857, and excavated in the 1860s by William Copeland Borlase. We hope you’ve enjoyed these videos as much as we enjoyed making them. Previous articles in the series can be found here. 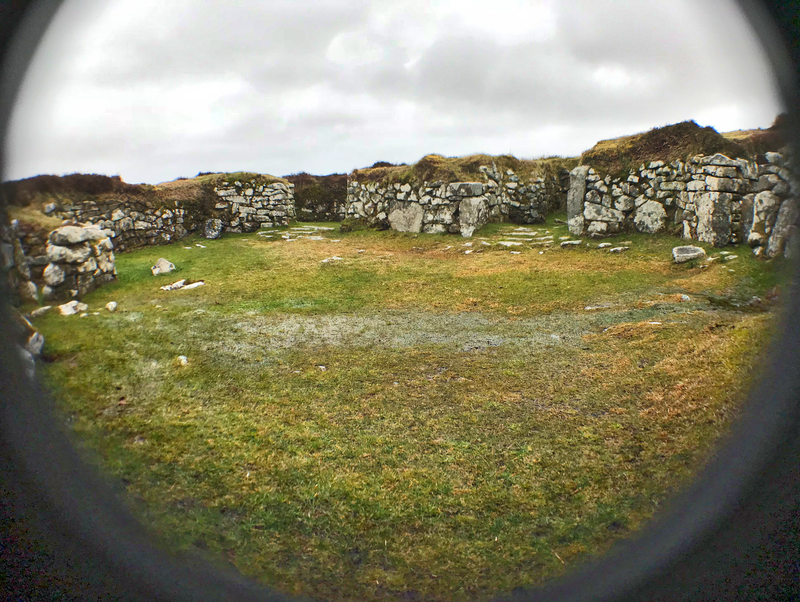 If there are other Cornish ancient sites you’d like to see featured, please leave a comment. I first visited Mulfra Vean courtyard house settlement in Penwith back in 2013, when CASPN were running a clear-up at the site. At that time the site was very overgrown and difficult to understand. Since then, CASPN have continued their regular clear-ups, and these have recently been augmented by an additional volunteer team from the Penwith Landscape Partnership (PLP) as part of their Ancient Penwith project, one of 13 projects funded by the Heritage Lottery Fund with additional funding from Cornwall Council and other sources, running over a 5 year period. My most recent visit to Mulfra Vean was prompted by my attendance in October last year at a one-day introductory course to archaeological surveying, held by PLP. The object of the day was to prepare volunteers to participate in producing surveys of sites in Penwith, starting with Mulfra Vean. Although ill-health at the time prevented me from committing to participate in the surveys themselves, I did volunteer to assist in the digitisation of any survey drawings. As I was aware that a significant effort had now been put into the survey, I visited the site to see what progress had been made. I was met by Jeanette Ratcliffe, the current Ancient Penwith Project Officer, providing maternity cover for Laura Ratcliffe-Warren. Jeannette was kind enough to show me the current state of the survey plans drawn up by the volunteer team to date and gave me a short tour of the site. 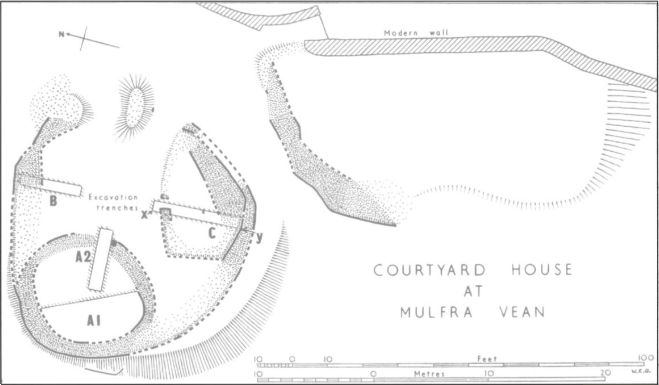 The settlement is currently dissected by a footpath which ascends Mulfra Hill, and the current effort is focussed to the west of the path, where one courtyard house and the possible outline of another have been laid bare. This part of the settlement was excavated in 1954 by Rev. Crofts, who sadly passed away the following year without publishing his results. Luckily Charles Thomas obtained his notes, and the results were eventually published in the Cornwall Archaeology Society journal. Survey by Mr. W. E. Griffiths, 1954 as published in Cornish Archaeology No. 2 1963. The features to the east of the path have long been hidden beneath dense undergrowth, but the brushcutters have recently been put to good use here, and details of the site can now be seen. First is an enigmatic double bank earthwork, which may possibly be related to medieval mining activity. To the north is another courtyard house, and this will no doubt be investigated further once the western survey is completed. The current plan is to commence digitisation of the survey drawings by the end of January, for inclusion in a planned web portal which will show the results of all 13 projects in due course. Keep an eye on the PLP website for updates on this and the other projects. 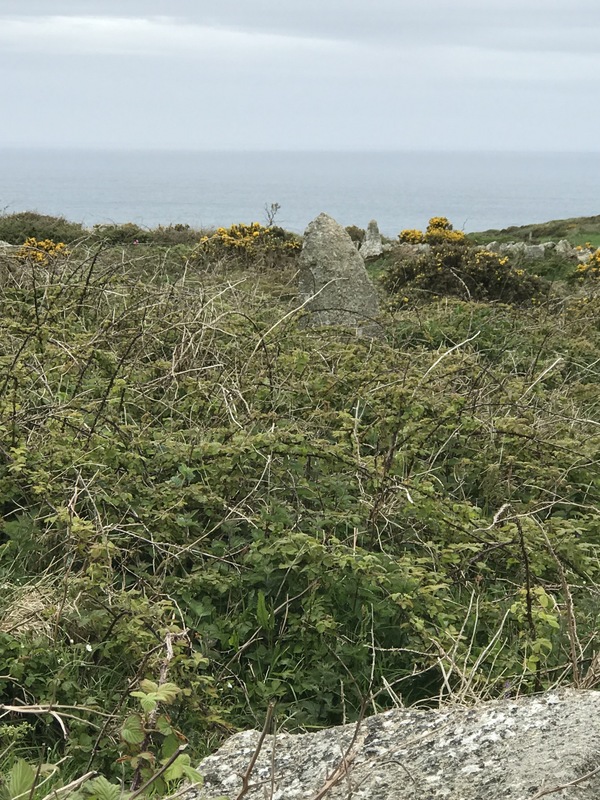 Another video from our tour of Cornish antiquities shows the Ballowall Barrow, also known as Carn Gluze (or Gloose), near St. Just in Penwith. This funerary cairn was used in several phases from the Neolithic to the Bronze Age. The site was excavated by Borlase in the 1800’s at which time the site was remodeled to ‘improve’ access to the inner chambers. Prior to this, the site had been largely hidden beneath mining rubble, which aided in its preservation. Carn Brea under threat from development! Object NOW! Carn Brea, near Redruth in Cornwall is an important Neolithic Tor Enclosure site. Word has just reached us that the area at the north base of the tor is under threat of development (shades of Old Oswestry here?). The intended use of the land is for a major BMX park and racetrack, a much-needed facility for the local youths. The right idea, in the wrong place! Below is a message from a local campaign group trying to get the development re-sited. Take a look at the two photos below. 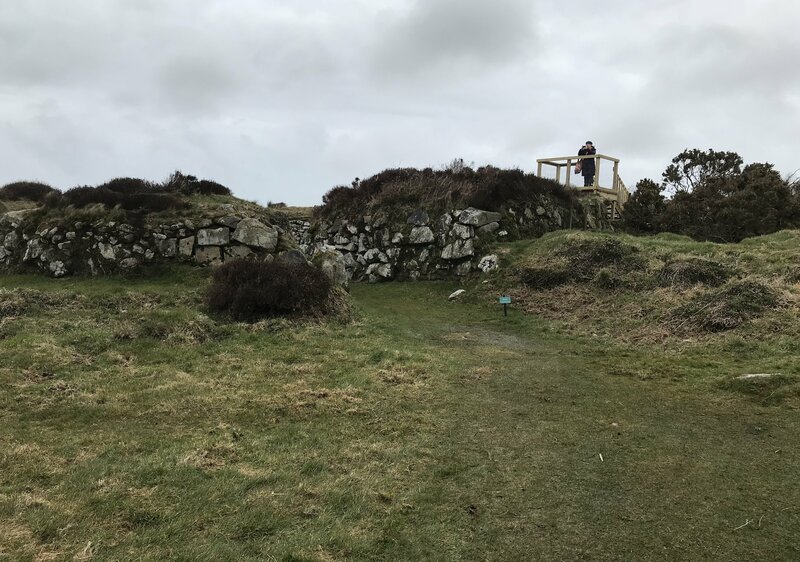 Photo 1 shows Carn Brea, according to Historic England a “Neolithic hilltop enclosure with a later settlement and defensive structures, a prehistoric field system, a medieval castle and deer park”. You will notice the green fields flanking the hill – well these vital flood areas (most of which are classed as a conservation area) are in danger – BIG DANGER. Photo 2 shows the same view but highlights two areas. The area marked in Red is hoping to be developed in the planning application. A local professional who was invited by Cornwall Council to assess the planning application said in their findings “Approval of this application might set a precedent for further encroachment of the land around Carn Brea.” – such as that marked in Blue. This has caused a big storm in the area; the proposed development is for a BMX racing facility. The Friends of Carn Brea Meadow (consisting of families, working local people and retirees) have nothing against Cornwall having such a facility but they cannot support an application to develop over 8 acres of beautiful land. Did you know the proposed development would see the destruction of over 140 perfectly healthy trees – trees that were planted by the local community over 20 years ago as a part of a publicly backed community initiate? But we’re not alone – over 2000 objectors have signed this online petition – https://bit.ly/2n15jBr saying they agree that this land should not be developed. Did you know this current land is free to access (YES that’s right, you can go there with you families, just like many locals do, for FREE) and the area in Red has matured over the years to become a beautiful natural meadow – it even has orchids growing in it. Not supermarket potted orchids – real naturally growing ones. Go and take your children there and show them. But we need your help to protect this area. The racetrack wants to use BIG LIGHTS so it can operate for up to 12 hours a day all year round (weather dependent). It wants to use a TANNOY SYSTEM so race commentary can be heard by the masses. It wants PARKING FOR UPTO 200 CARS. It wants to WIDEN PARTS OF THE GREAT FLAT LODE (a Heritage Mining Trail) SO CARS CAN DRIVE DOWN IT. – Falls within a conservation area. – Is a World Heritage Site. – Is next to one of Cornwall’s largest UNESCO World Heritage assets. – Is listed as partly in county wildlife site area. – Is listed as an early medieval site. So how can you help us save this land? Go to https://goo.gl/9g3Hny by the 9th of August and submit an objection – this is your only formal way to voice your objections in time to Cornwall Council. Thank you, let’s try and save Carn Brea and the surrounding land from development as once it’s gone – there’s no getting it back. 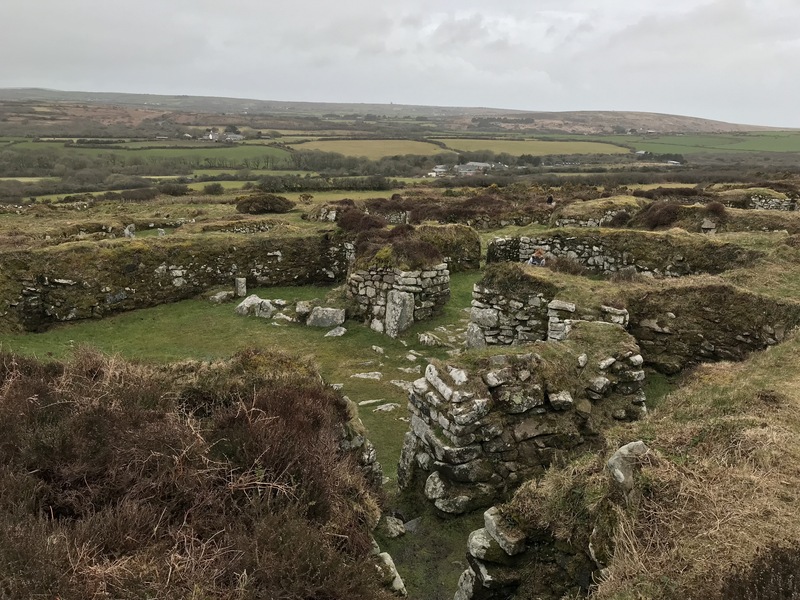 All of the information used in this post was sourced from Cornwall Council, the submitted planning application documents, and Historic England. Stannon Moor: A NEW(!) stone row with tricks and treats! We last featured the stone circle on Stannon Moor here about 9 years ago! So a revisit was long overdue. Especially as I’d heard of a 4-stone ‘setting’ close to the circle that I’d not noticed on my last visit. I arranged to meet up once again with Dr. Sandy Gerrard along with Gordon and Janet from ACE Archaeology Club in Devon for a return visit to the circle and environs. 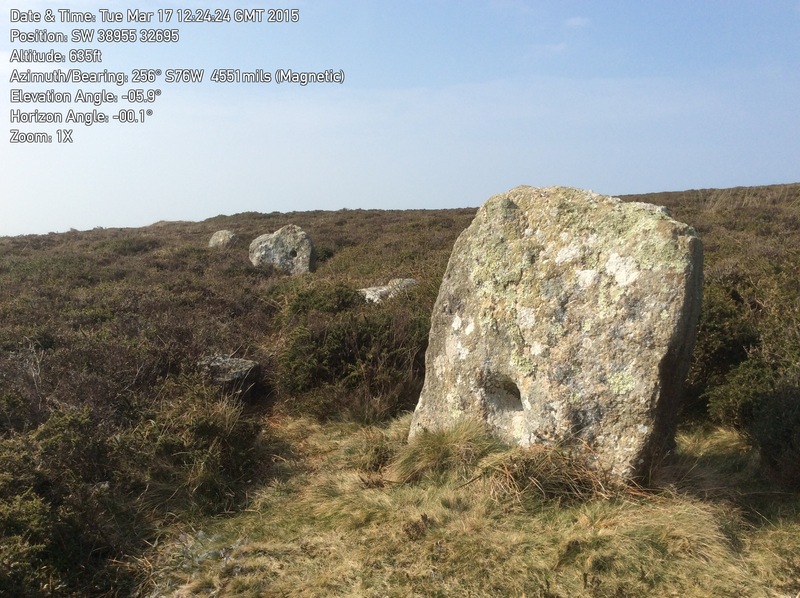 The stone setting is enigmatic, consisting of two pairs of stones, roughly aligned to the south-east with Stannon Moor and Louden Hill stone circles (although the circles are not intervisible). The setting is a staggered linear arrangement of four small end-set granite slabs. The northern two slabs of the setting are 1.25m apart on a north-south axis, the greater width of each of these northern slabs is set transversely to the axis of the pair. The southern two slabs are 2m apart on a NNW-SSE axis, with their northern slab 1.8m south-west of the southern slab in the northern pair. The southern two slabs are smaller than those to the north, with their greatest width roughly in line with the axis of the pair. Taking a look around, we espied a small stone on the horizon to the south, which appeared to be in direct alignment with the two southern stones. Without the recent dry weather, I doubt we would have spotted this stone from the setting. The southern stones of the setting, with the horizon stone arrowed. Leaving a ranging pole as a guide we walked south where further stones, 10 or 11 in total, also appeared to line up, for a distance of around 150m. Did we have a row? The southernmost stone appeared to have the attributes of a ‘blocking’ stone, a common feature of Neolithic stone rows. 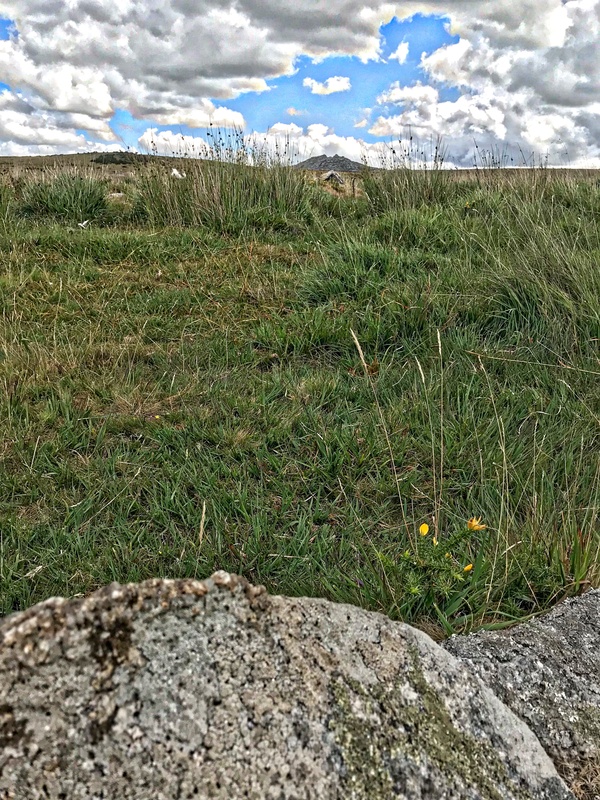 Looking roughly north-east, the blocking stone lined up with a large moorstone to point directly at the notch on Rough Tor – was this our first landscape treat? Is it an astronomical alignment? View from the southern blocking stone toward Rough Tor. From the north walking south, Brown Willy appears on the south-east horizon as soon as the stone setting is left behind, a view which grows the further south you travel. Around 2/3rds along the row, Alex Tor to the south-west dips below the horizon, disappearing from view. Walking north, there are three ‘sea triangles’ to be seen to the west, which disappear one by one as you move north. From the southern blocking stone, the viewer appears to be in the centre of a landscape bowl, an omphalos moment perhaps? This row, if that is what it is – and all the signs point that way – is not currently listed on the HER, but once the survey notes have been analysed, with field notes and measurements properly written up on our sister site: The Stone Rows of Great Britain we shall almost certainly be taking steps to ensure it is included. Many thanks to Sandy, Gordon, and Janet for an interesting day out on the moors! 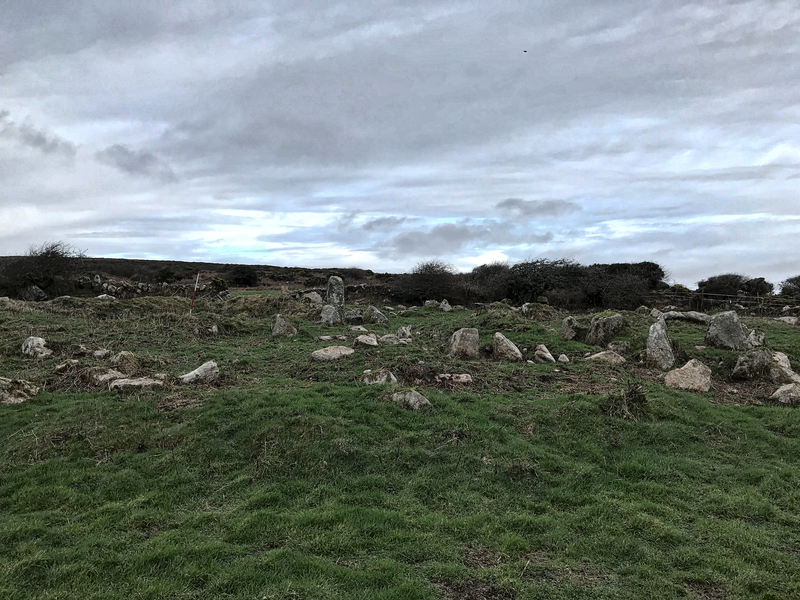 Another stop on our video tour of Cornish antiquities sees us climb up onto Chun Downs to visit the Neolithic burial cairn of Chun Quoit. Wath this space for more videos to come. Previous videos in the series can be found here. 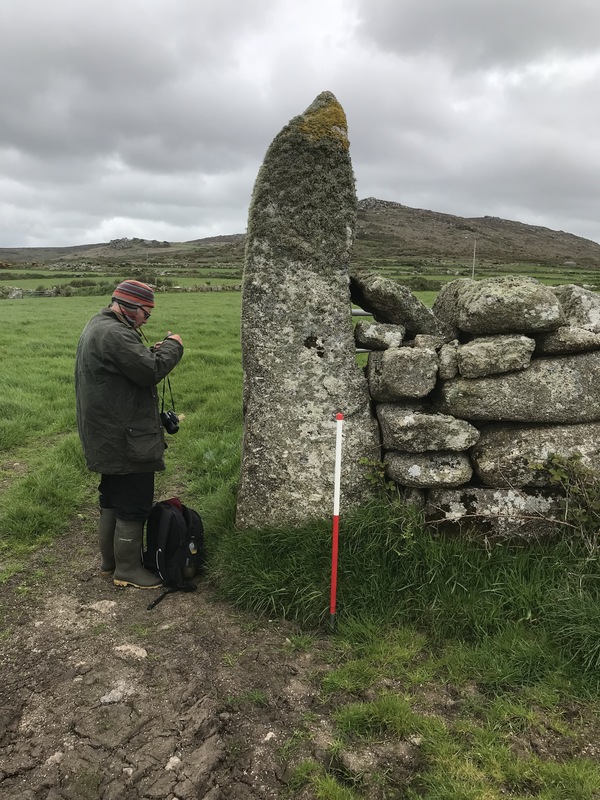 I recently had the pleasure of accompanying Dr. Sandy Gerrard on a field trip to visit two possible stone rows in West Penwith, Cornwall. Below is a short report of our visit. The first row visited was Treveglos at Zennor. This purported row consists of three uprights. 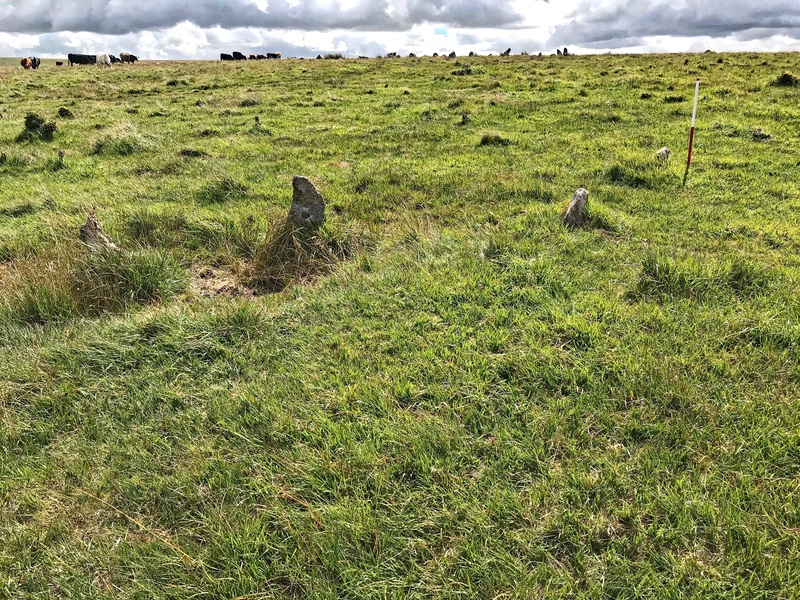 Having scoped out the site a couple of weeks previously, the row was found easily enough, due to the large stone at the SE end of the row acting as a gatepost, above the level of the surrounding fields. The other two upright stones were on field boundaries heading to the NW in adjoining fields and were easy enough to spot. 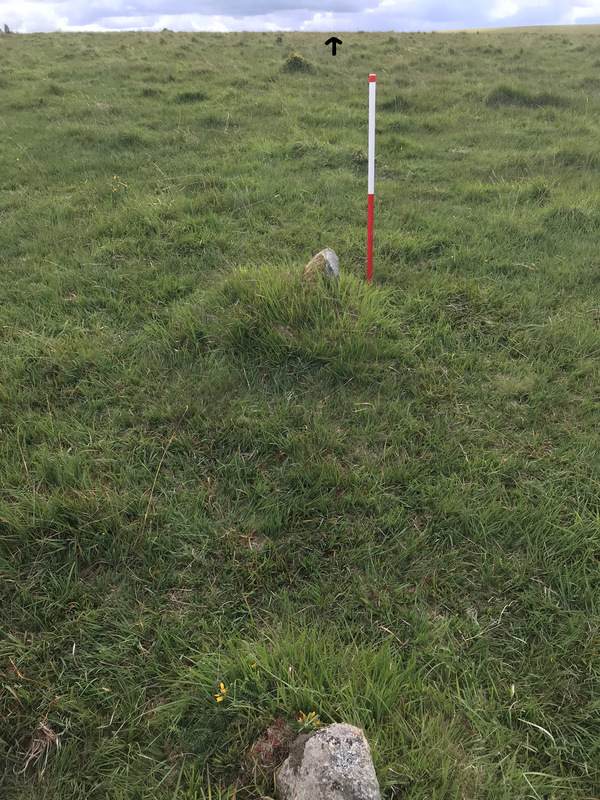 A recumbent stone was also found in the field near to the gatepost, looking as if it had fallen to the west from a position just slightly out of alignment with the other three. However, the area has many earth-fast stones, and this alignment could well be a co-incidence. Sadly, upon closer inspection it appears that the NW-most stone is erected upon an Iron Age field boundary, the middle stone bears characteristic tare and feather drill marks suggesting that it must have been erected sometime after 1800AD, and is erected upon what seems to be medieval field boundary. The large stone to the SE has been drilled for use as a gatepost, but given its height may well have Neolithic origins as a standing stone. We then moved on to the holed stones on Kenidjack Common, near the Tregeseal stone circle. I was last here a couple of years ago and reported on them then. Sandy confessed that they resembled nothing he’d seen on any other row, and was quite nonplussed. 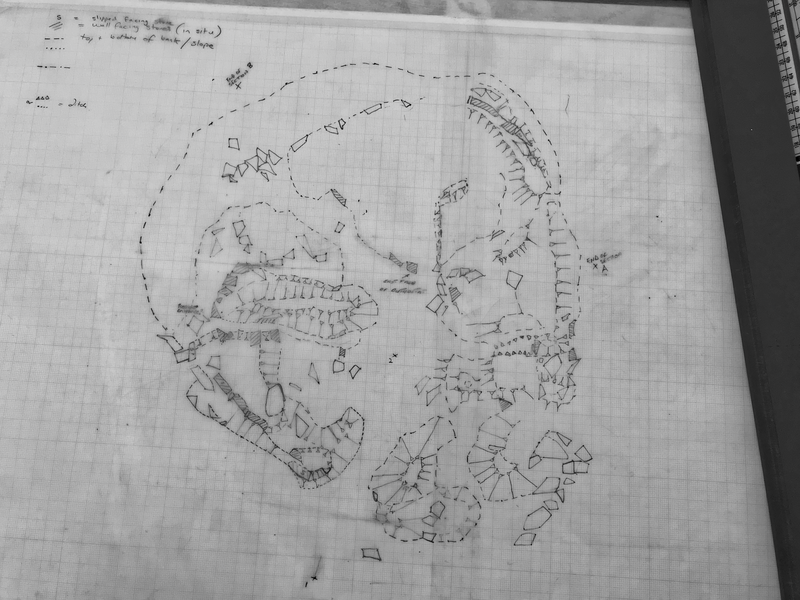 The fact that all of the stones are set at differing angles to the line of the ‘row’, and that none of the holes in the stones are targeted at anything specific only added to his confusion. The outlier appears to be set upon a bank – either a field boundary or possible dried-up watercourse. The spacing of the stones has been changed in the intervening years, and doubtless their orientation has also changed. Given this fact, it is unlikely that a definitive interpretation will ever be obtained. 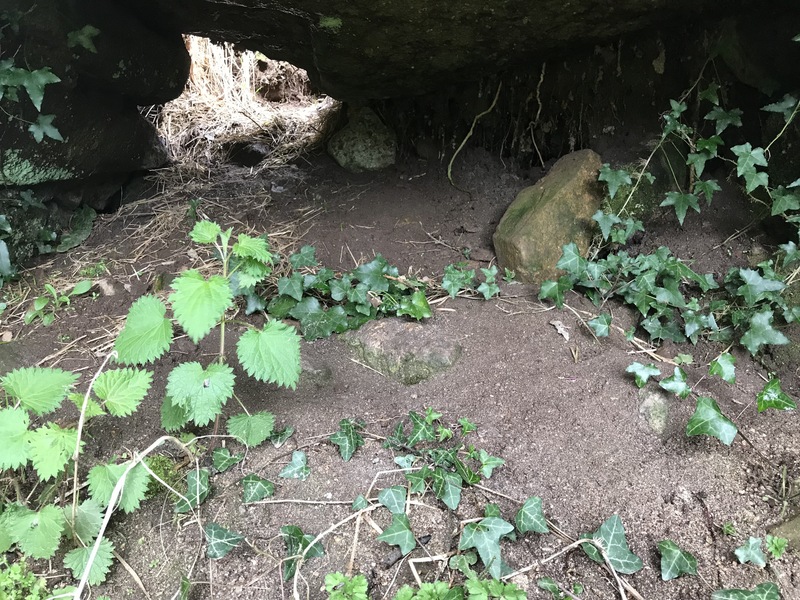 The conclusion on the day was that neither row is likely to be Neolithic in origin, but Sandy will publish the full results of his analysis on his Stone Rows website in due course. Our video tour continues with the remaining circle at Tregeseal, in the shadow of Carn Kenidjack, the ‘Hooting Carn’.